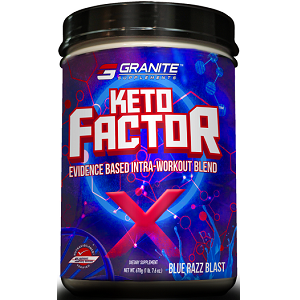 In this review of Granite Supplements Keto Factor, we closely look at the ingredients in this product and we look at how much it costs, to help you decide if it is a worthwhile supplement. Granite Supplements Keto Factor provides its users with a number of ketone salts and amino acids to provide them with sources of energy for mental focus and muscle function during low carbohydrate dieting. The beta hydroxybutyrate salts separate in the blood to release the minerals like calcium, magnesium and sodium that help muscles to contract and relax more uniformly. They also release the beta hydroxybutyrate, which is a ketone. When there are high enough levels of beta hydroxybutyrate in the blood, the body is considered to be in a state of ketosis. The ashwagandha extract was most likely included because the plant has been used in traditional medicine to promote general health for many decades. We were able to find some research on the effects of ashwagandha and ketosis, but what we found is that it can have a reducing effect on energy production from fat derived molecules, which essentially defeats the purpose of ketosis. The rest of the ingredients are all amino acids which are very important for general health, but can also be converted to ketones if necessary. For men, one to two scoops of the supplement should be mixed with 26 to 33 ounces of water. For women, one scoop can be mixed with 17 oz of water. If intending to use this as a pre-workout supplement, it should be taken 15 minutes before training and finished before the halfway point of the workout. No major side effects have been reported with the use of the supplement. However pregnant women, nursing mothers and people with chronic diseases should consult a doctor before using this supplement. A container which has 20 servings in it can be bought online for $59.99. This price does not include shipping and there are various options for how the product is shipped, where the more expensive options result in a quicker delivery. The product is not guaranteed but they can be returned within 30 days of purchase if they are returned in their original package unused and unopened. This returns policy doesn’t really protect the customers from anything except if they change their mind that they do not want to try the supplement. This supplement contains some well considered ingredients which do not present any major side effects when used. But, we do have some concerns about the supplement that he does to believe it’s not the best on the market. For example the manufacturer has included in ingredient which may antagonize the effects of ketosis. The price is also quite high especially considering that Granite Supplements doesn’t offer a guarantee, but only a returns policy on unopened items. We definitely believe there are better ketogenic supplements on the market than this one. John Parker	reviewed Granite Supplements Keto Factor	on August 17th	 and gave it a rating of 3.